Microsoft have most certainly have started to show that they can also deliver innovative and useful products, plus theyâ€™re not afraid to think out of the box. Things like Project Natal, Windows 7, Bing, and a lot more have started pouring out of Microsoftâ€™s campuses. Which happens to be a good thing for the consumers, because they are the ones who stand to benefit from all this. The latest piece of innovation is actually a concept of a futuristic virtual keyboard â€“ slightly like the stuff we find on touchscreen devices like the iPhone etc. The problem with having virtual keyboards on these devices is that its very difficult to type on them. This is mainly because of two reasons. The first is that virtual keyboards are usually small, and their layout isnâ€™t like the standard physical keyboards, which means we have to look at the keys before hitting them. The other reason is that they donâ€™t provide tactile feedback like you get when you press a button. Of course you canâ€™t really solve this problem on a virtual keyboard, but engineers at Microsoft might have found a way to address the first issue. The solution is virtual keyboard that aligns the keys dynamically based on the position of your palm or fingers, so youâ€™ll always have the same frame of reference as youâ€™d have on physical keyboards â€“ meaning you donâ€™t have to look at keys before pressing them because youâ€™d be aware of their position subconsciously. To make things more interesting, you can pop up the keyboard anywhere on the screen by certain gestures like placing your fingers on it. And you can also hide it in a similar fashion. 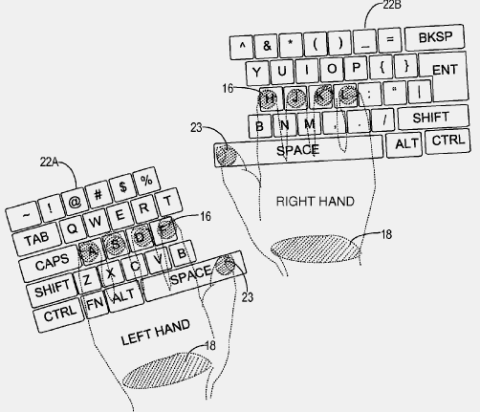 The keyboard can also be split into two parts (as seen in the diagram), so you donâ€™t have to position your hands close to each other. Pretty neat stuff. Original Photo by Gizmodo. I just did the overlays. Thereâ€™s one final thing puzzling me though. Where do Microsoft intend to use this tech? It certainly wonâ€™t fit on small cell phone screens easily. The only logical applications I can thing of are at places like the Surface, or theyâ€™re new in-research tablet Courier. It would be really easy to place a split keyboard onto the two screens of the device, not to mention the comfort of using it. It may also find its way into future versions of Windows, to be used in Windows touch input. I guess the only thing we can do is wait here and things would start to unroll on their own once Microsoft officially announces the Courier. Mh, the scale of the overlay in the composed picture seems too small (imagine a hand of this size holding the pen). And in my understanding the ball of the hand must come to lie on the display in order to determine the position of the virtual keyboard, i.e. the hands are positioned too low, I think. Seems not so well suited for the Courier, because it would probably occupy virtually all of the screen area. But anyway, it’s a very interesting concept for larger displays like the Surface. Simply start typing where your hands are. Keyboard and mouse literally always at hand. The screens would be 7″ and the overlay was just a rough mockup by me. 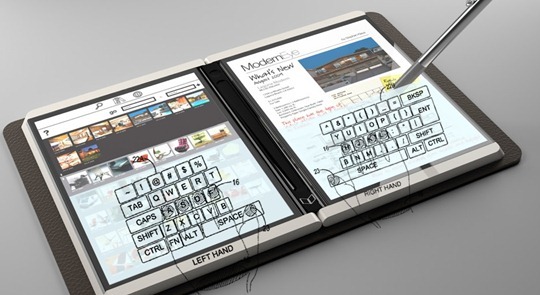 Comparing that to the 3.5″ screens we have on phones today, I’d say we have enough room for a half keyboard. But then again, it would be pretty crammed to function the way it is intended. Of course it would be so much better if implemented on the surface. So I don’t understand where are new technologies? Split the keyboard to two pieces? It’s not a news. and because my idea to this how easy to use split keyboard on screen, and remember the past microsoft key board, is great, and i guess, freeware key board might possible to installed on win 7, microsoft windows based, we have alot of programmer who can do that, and i surely hope microsoft can do the same thing, split keyboard, for my thumb, dock at left and right of the screen and can be moved up and down to work, nice! Ran 16 queries in 0.181 seconds.